While following your manufacturer’s recommended maintenance schedule is strongly encouraged, if you’ve put off having your vehicle serviced, there’s still time to perform preventative maintenance. Generally, as Phelan points out, any concerns should be taken care of before bad weather hits. Besides getting your vehicle up-to-date with regular service and maintenance – including *oil and filter changes, battery testing and brake inspections – you should also check that your wiper blades are in proper working order. If in need of replacement, consider rubber-clad blades designed for winter driving, because they can help prevent ice buildup. The acclaimed “beam” style wiper blades used on Mercedes-Benz vehicles also perform very well in conditions with snow and ice. In addition to installing new wiper blades, make sure to fill up on washer fluid to keep your windshield free of frost, ice, snow and road salt. Depending on your location, consider driving with winter tires to maximize your vehicle’s performance and safety. Unlike performance or all-season tires, winter tires feature deep treads that help grip snow and ice for enhanced traction. Winter tires are also designed and manufactured with special compounds which allow them to perform much better in low temperatures, even on dry roads. If you don’t plan on investing in winter tires, make sure to check the treads of your current tires. Worn-down treads can reduce braking traction and increase stopping distances in wintry conditions. 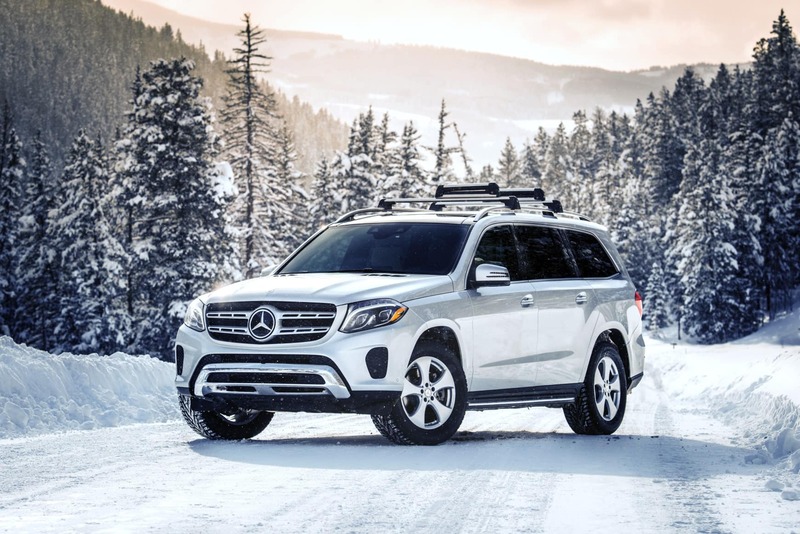 When the going gets tough, an all-wheel-drive (AWD) or four-wheel-drive (4WD) system can provide the extra traction you need to get moving in wet, snowy and icy conditions by transferring power to all four wheels. However, if you’re driving in winter weather conditions, Phelan stresses, “People have to remember that vehicles with 4WD or AWD don’t necessarily brake or turn any better than a front-wheel drive (FWD) or rear-wheel-drive (RWD) vehicle.” If you’re driving on slippery roads, remember to slow down and allow more distance between yourself and the vehicle in front of you. Phelan also reminds drivers to turn on their headlights – especially when the snow is coming down. Many new vehicles come equipped with daytime running lights (DRL), and while they’re great for daytime driving, they’re fairly dim and don’t illuminate the road in front of your vehicle. Remembering to switch on your headlights and taillights will increase your visibility and make it easier for other drivers to see your vehicle as well. Even if your own vehicle is able to navigate the conditions, there’s always a chance that you may encounter other vehicles that are stuck, causing you to become delayed or even stranded. As an added precaution, keep an emergency blanket, flashlight, water and shovel in your vehicle, keep your gas tank at least half-full and ensure that your exhaust is clear, according to Phelan. And remember, with Mercedes-Benz Roadside Assistance and other roadside assistance services, you are never alone – help is just a phone call away. Located at 295 Burnett Road in Chicopee, MA, the Service Department at Mercedes-Benz of Springfield can help fulfill your service-related needs, from tire rotations to transmission issues. Contact our dealership to schedule a service appointment and prepare your vehicle for winter.